Established in 2012, the Kroger Community Food Pantry operates as a choice food pantry and is open to the community four days a week. Individuals and families with household incomes less than 200% of the Federal Poverty Level are eligible to receive food from the pantry. Mid-Ohio Foodbank launched the Kroger Community Pantry in January 2012. The pantry is located at the Foodbank’s 3960 Brookham Drive location in Grove City. For more information, call 614.317.9487. The pantry follows the same State of Ohio guidelines that the Foodbank’s other partner agencies use and offers a mix of non-perishable products, frozen meats, dairy products, fresh produce and an assortment of breads. Tuesday – 10:00 a.m. to 3:00 p.m.
Wednesday – 5:30 p.m. to 7:30 p.m. Please arrive at least 15 minutes prior to posted closing time. These produce markets provide fresh food to individuals and families struggling to make ends meet. Markets offer fresh fruits and vegetables as well as bread and dairy items. Serving up to 300 families, eligibility to obtain food from a market is 200% of the Federal Poverty Line. Q: This is my first visit. What do I do? If you choose Pantry Express you do not need a color coded number. Pantry Express is open the same hours as the Food Pantry. Enter through the glass door near the warehouse doors. For a full shop, please complete an order form for the dry goods. Produce, bread and meat will be added to your order and brought to your car with minimal wait time. If you are picking up bread and produce only, you do not need to fill out an order form. Please take a colored card from the greeter at the door. When the color of square in the window matches your card, please enter pantry and take a seat. When the number on your card is displayed, please proceed to the Welcome Desk. Once your registration is complete, please take a seat until a volunteer calls your name. You can shop once a week. One visit will be a full shop of everything we have to offer and the other visits will be produce and bread only. No, this is a walk in, choice pantry. You choose your food. Q: How do families qualify to get food? We use the same State of Ohio guidelines that our partner agencies use. Families must have income below 200% of the Federal Poverty numbers, be residents of Ohio, and provide identification for each member of the household they are claiming. For example, a family of four making $49,199 or less a year would be eligible to receive food. Learn more about the qualification process here. Q: What documents do I need to bring when I visit the pantry? If it’s your first visit to the pantry, take your picture ID and one proof of residency to the front desk. Proof of residency should include your name and current address, dated within the last 90 days. This could be a utility bill, lease agreement, medical bill, Ohio Department of Job and Family Services announcement. If you’ve been to the pantry before, you just need your picture ID. Q: Is there a cost to shop at the Pantry? There is no cost for the food we provide to the hungry families we serve. Q: Does the Pantry serve families outside of Grove City? 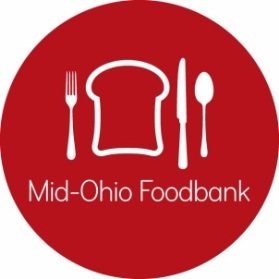 Yes, the Pantry at Mid-Ohio Foodbank (MOF) is open to all qualifying residents in and around Columbus & Franklin County. Given the proximity to Pickaway, Madison, and Fairfield counties, we also help families from those communities from time to time. Q: How do families shop for their food? Once your registration is complete please take a seat until a volunteer calls your name and then you will shop. We utilize some of our wonderful volunteers to assist families as they come through the pantry. Through our signage and volunteers, we advise the families about what foods are available and which are healthy choices. Our volunteers also can push shopping carts for people who need a little extra assistance. To sign up for pantry volunteer shifts or to learn about other Foodbank volunteer opportunities, click here. Q: Can I shop for someone else? Yes, this is called a Proxy Shop. There must be a signed Letter of Proxy on file prior to shopping. You are required to submit a new Letter of Proxy every July or your first visit after July. Please ask someone at the welcome desk for a Letter of Proxy form. To shop please return this on your next visit along with a picture ID and proof of residency for the person you are shopping for. Due to the large number of people during Produce Markets, we are unable to offer Proxy Shopping. Q: Will this "hurt" other food pantries in the area? Not at all! There is such a demand right now that nearly every pantry is running at capacity, and some are scheduling families two or three days in advance. Q: Does the Food Pantry offer any additional services? We also offer other support services through the Ohio Benefit Bank and other 3rd-party groups. This helps families stretch their food budget, live healthier, and be better prepared for the everyday challenges of food insecurity. Feel free to call the Food Pantry Coordinator at 614.317.9482 with any additional questions about the Kroger Community Pantry.